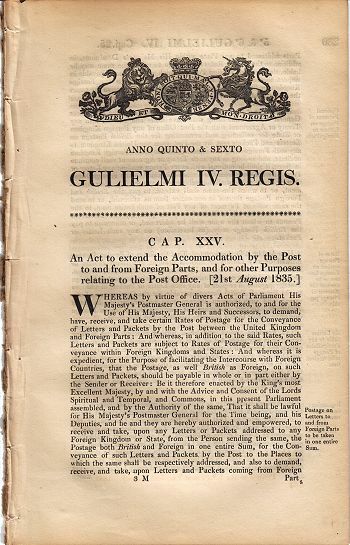 This section consists of the actual texts of Acts of Parliament relating to postal matters. Until 1969, the Post Office was a government department, with the Postmaster-General as a Cabinet-level Ministerial position. Major changes to Post Office operations – such things as postal rates and new services – originally had to be specifically authorised by an Act of Parliament, often going into significant detail. The system gradually developed over time and Acts would authorise many routine changes – e.g. new postal rates – to be made by Treasury Warrant. It should perhaps be pointed out that the Acts are legal definitions and are often written in a style that takes some parsing – clauses are frequently in the form of a single multi-part sentence, and these can sometimes stretch out for a page or more! Since the point is to provide original sources in electronic text form that can be cut and pasted, etc, no attempt has been made to split these up. Likewise, the original spellings have been retained (except for the replacement of long "s" with short). The original formatting, if more than just a block of text, has been copied as closely as possible – although it was not practical to try to capture every nuance of the typesetting exactly (especially as this can vary between printings of the Acts). There should however be no substantive differences that would affect the meaning due to this factor. The marginal summary notes not part of the actual text are generally not included, but where they are they have been made into links to the appropriate clause. Many thanks to Andrea Rossignoli, who first prepared a number of these texts from image-based versions in PDF files, and kindly allowed us to use them here. They can also be found on his website LetterStamper and on this Stampboards thread.